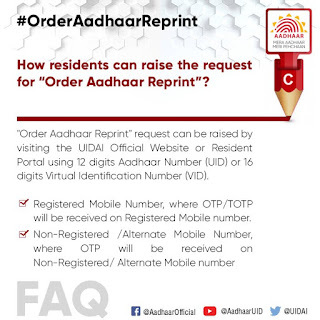 UIDAI helps citizens in ordering a reprint. The service is done on a pilot basis, which can be availed by residents by paying a nominal charge. The service is generally done when you have lost or misplaced your Aadhaar copy. Citizens can raise the request for Aadhaar reprint, by visiting UIDAI Official Website or Resident Portal using 12 digits Aadhaar Number (UID) or 16 digits Virtual Identification Number (VID). This service can be done using both registered mobile number and non-registered one as well. In both cases, you will receive a One-Time-Password. However, it is always safe to make sure your mobile is registered with Aadhaar. Here’s how you can order Aadhaar reprint using the registered mobile number. Step 5 – If you have TOTP, choose option “I have TOTP”” by clicking in check box else Click on “Request OTP” button. Step 6 – Enter OTP/TOTP received on registered mobile number. Step 7- Click on the check box against “Terms and Conditions”. (Note: Click on hyper link to see details). Step 8 – Click on “Submit” Button to complete OTP/TOTP verification.